Simon Mainwaring’s new book, We First, launches this week. It is a book about how connectedness through social networks can help satisfy the needs of business bottom line and a healthy, sustainable planet. 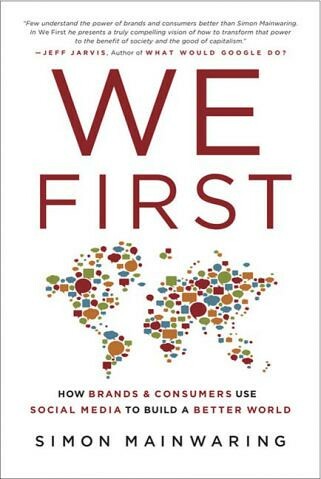 The book offers a new marketplace model that is not drive by “me first” corporate greed, but how corporations can leverage social media to build a better world and earn consumer goodwill and loyalty. Simon isn’t the first to suggest that capitalism has lost its way and needs a serious makeover. His goal is inspire discussion and ultimately change. The book has many case studies that illustrate how corporations are integrating social media for social good. These include: Proctor & Gamble, Walmart, Starbucks, Toyota, Nike, and more. The book offers lots of food for thought and discussion. It’s already in the top 100 books over at Amazon. Sustainability: This is about reducing degradation of the planet’s condition and to seek renewable sources of energy that do not contribute to greenhouse gases, and to seek out methods that reduce waste and reuse resources. He also applies the concept of sustainability to protect human capital. Fairness of Reward: This value encompasses the wide range of incentives companies give to their suppliers, employees, and investors. This value encompasses the spirit of fair trade and transparency. Fiscal Responsibility: In the book, this term is not used an accounting term. It refers to a corporation’s responsibility to shoulder the impact they have on the economy. He describes the use of a “flash mob” going to a shareholder’s meeting and demanding a claw-back for ill-gotten bonuses. Accountability: This is about trust and the importance it has assumed as the new social currency for businesses. It also includes transparency – that corporations must operate with honesty, credibility, and congruency between their words and deeds. Purposefulness: This is a demand that businesses do more than build wealth – that the bottom line adds purpose and meaning to life. Mainwaring suggests a “purposefulness” index. Engagement: This is about having brands be in dialogue with consumers. Global Citizenry: As technology is increasingly connecting us, it makes everyone aware of our interconnectedness. We can no longer ignore what is happening in our world – and that we must act as global citizens. Part of me wants to believe that this isn’t just an oxymoron, that it is possible to build We First values into the framework of capitalism. But I’ve also been studying the history of capitalism and how it developed. In looking at the history, it seems hard to say that our current version of capitalism has “lost its way” – which implies there was a previous version of capitalism where corporate greed didn’t exist. While corporate greed might look different today, there’s a long history of corporations putting profit over the needs of people. As we try to instill new values into our economic system, it will be good to know our history and the history of our current system. There’s lot of information out there to support Mainwaring’s view, from the success in spite of recession of value-driven small businesses to the entrepreneurs who have built their enterprises to multi-million dollar business while holding the belief that giving back is part of success. I think the realization that long-term success — including healthy communities — is a fiduciary responsibility of greater value than short-term profit. The values listed are miore than luadable. However, the examples of corporations used as examples leave me puzzled. Has it become acceptable to pillage workers and the earth, make some minor adjustments to appear to be improving, and then claim sustainability? Have we become such mindless consumers to drink this Koolaid? This book seems more like a marketing (propaganda) tool than an attempt to educate. That it has reached the top seller list before release, before most of the public even becomes aware of it, hints that transnational corporations, or their tools, have learned a trick from their right-wing lunatic bedfellows–use your enormous financial resources to buy books that make you look good to “demonstrate” their poularity among the people.